What are rheumatoid arthritis symptoms and signs? What are rheumatoid arthritis causes and risk factors? What are complications of rheumatoid arthritis? What are the stages of rheumatoid arthritis? What are rheumatoid arthritis treatment options? What are types of rheumatoid arthritis medications? What are newer rheumatoid arthritis medical treatments? What about rheumatoid arthritis and pregnancy? What is the prognosis for patients with rheumatoid arthritis? What are tips for living with rheumatoid arthritis? What specialists treat rheumatoid arthritis (RA)? Is it possible to prevent rheumatoid arthritis? Are there support groups for people with rheumatoid arthritis? Where can people get additional information on rheumatoid arthritis? What new information about RA has come from the 2015 national meeting of the American College of Rheumatology? What research is being done on rheumatoid arthritis? Rheumatoid arthritis is an autoimmune disease that causes chronic inflammation of the joints and other areas of the body. symptoms and signs that affect both sides of the body (symmetry). Rheumatoid arthritis is a chronic disease characterized by periods of disease flares and remissions. Chronic inflammation of rheumatoid arthritis can cause permanent joint destruction and deformity. Damage to joints can occur early and does not always correlate with the severity of RA symptoms. The "rheumatoid factor" is an antibody that can be found in the blood of 80% of people with rheumatoid arthritis. Rheumatoid factor is detected in a simple blood test. Possible risk factors for developing rheumatoid arthritis include genetic background, smoking, silica inhalation, periodontal disease, and microbes in the bowels (gut bacteria). There is no cure for RA. The treatment of rheumatoid arthritis optimally involves a combination of patient education, rest and exercise, joint protection, medications, and occasionally surgery. Medications used in the treatment of rheumatoid arthritis include NSAIDs, DMARDs, TNF alpha inhibitors, IL-6 inhibitors, T-cell activation inhibitors, B-cell depleters, JAK inhibitors, immunosuppressants, and steroids. Researchers have developed medications that are biosimilar to biologic medications, and many others are currently under study. Early RA treatment results in a better prognosis. Rheumatoid arthritis can affect people of all ages. The cause of rheumatoid arthritis is not known. Rheumatoid arthritis (RA) is an autoimmune disease that causes chronic inflammation of the joints. Autoimmune diseases are illnesses that occur when the body's tissues are mistakenly attacked by their own immune system. The immune system contains a complex organization of cells and antibodies designed normally to "seek and destroy" invaders of the body, particularly infections. Patients with autoimmune diseases have antibodies and immune cells in their blood that target their own body tissues, where they can be associated with inflammation. While inflammation of the tissue around the joints and inflammatory arthritis are characteristic features of rheumatoid arthritis, the disease can also cause extra-articular inflammation and injury in other organs in the body. Because it can affect multiple other organs of the body, rheumatoid arthritis is referred to as a systemic illness and is sometimes called rheumatoid disease. Rheumatoid arthritis is a classic rheumatic disease. Rheumatoid arthritis that begins in people under 16 years of age is referred to as juvenile idiopathic arthritis or JIA (formerly juvenile rheumatoid arthritis or JRA). RA symptoms come and go, depending on the degree of tissue inflammation. When body tissues are inflamed, the disease is active. When tissue inflammation subsides, the disease is inactive (in remission). Remissions can occur spontaneously or with treatment and can last weeks, months, or years. During remissions, symptoms of the disease disappear, and people generally feel well. When the disease becomes active again (relapse), symptoms return. The return of disease activity and symptoms is called a flare. The course of rheumatoid arthritis varies among affected individuals, and periods of flares and remissions are typical. Muscle and joint stiffness are usually most notable in the morning and after periods of inactivity. This is referred to as morning stiffness and post-sedentary stiffness. Arthritis is common during disease flares. Also during flares, joints frequently become warm, red, swollen, painful, and tender. This occurs because the lining tissue of the joint (synovium) becomes inflamed, resulting in the production of excessive joint fluid (synovial fluid). The synovium also thickens with inflammation (synovitis). Rheumatoid arthritis usually inflames multiple joints and affects both sides of the body. In its most common form, therefore, it is referred to as a symmetric polyarthritis. Early rheumatoid arthritis symptoms may be subtle. The small joints of both the hands and wrists are often involved. Early symptoms of RA can be pain and prolonged stiffness of joints, particularly in the morning. Symptoms in the hands with rheumatoid arthritis include difficulty with simple tasks of daily living, such as turning door knobs and opening jars. 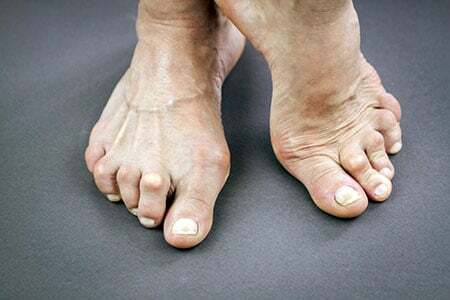 The small joints of the feet are also commonly involved, which can lead to painful walking, especially in the morning after arising from bed. Occasionally, only one joint is inflamed. When only one joint is involved, the arthritis can mimic the joint inflammation caused by other forms of arthritis, such as gout or joint infection. Chronic inflammation can cause damage to body tissues, including cartilage and bone. This leads to a loss of cartilage and erosion and weakness of the bones as well as the muscles, resulting in joint deformity, loss of range of motion, destruction, and loss of function. Rarely, rheumatoid arthritis can even affect the joint that is responsible for the tightening of our vocal cords to change the tone of our voice, the cricoarytenoid joint. When this joint is inflamed, it can cause hoarseness of the voice. Symptoms in children with rheumatoid arthritis include limping, irritability, crying, and poor appetite. Osteoarthritis is a noninflammatory joint disease whereby the cartilage of the joint thins, typically asymmetrically -- so only one knee or hand may be affected. 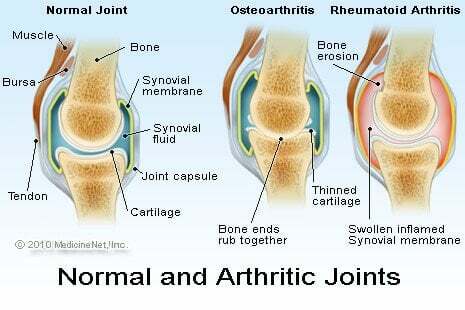 The illustration on the previous page demonstrates the difference between a normal joint and those of osteoarthritis and rheumatoid arthritis. A joint is where two bones meet to allow movement of body parts. Arthritis means joint inflammation. The joint inflammation of rheumatoid arthritis causes swelling, pain, stiffness, and redness in the joints. The inflammation of rheumatoid disease can also occur in tissues around the joints, such as the tendons, ligaments, and muscles. In some people with rheumatoid arthritis, chronic inflammation leads to the destruction of the cartilage, bone, and ligaments, causing deformity of the joints. Damage to the joints can occur early in the disease and be progressive. Moreover, studies have shown that the progressive damage to the joints does not necessarily correlate with the degree of pain, stiffness, or swelling present in the joints. The cause of rheumatoid arthritis is unknown. Even though infectious agents such as viruses, bacteria, and fungi have long been suspected, none has been proven as the cause. The cause of rheumatoid arthritis is a very active area of worldwide research. It is believed that the tendency to develop rheumatoid arthritis may be genetically inherited (hereditary). Certain genes have been identified that increase the risk for rheumatoid arthritis. It is also suspected that certain infections or factors in the environment might trigger the activation of the immune system in susceptible individuals. This misdirected immune system then attacks the body's own tissues. This leads to inflammation in the joints and sometimes in various organs of the body, such as the lungs or eyes. It is not known what triggers the onset of rheumatoid arthritis. Regardless of the exact trigger, the result is an immune system that is geared up to promote inflammation in the joints and occasionally other tissues of the body. Immune cells, called lymphocytes, are activated and chemical messengers (cytokines, such as tumor necrosis factor/TNF, interleukin-1/IL-1, and interleukin-6/IL-6) are expressed in the inflamed areas. Environmental factors also seem to play some role in causing rheumatoid arthritis. For example, scientists have reported that smoking tobacco, exposure to silica mineral, and chronic periodontal disease all increase the risk of developing rheumatoid arthritis. There are theories about different gut bacteria (the microbiome of gut microbes that naturally inhabit the lining of the bowels) that might trigger the onset of rheumatoid arthritis in genetically susceptible individuals. No specific microbes have been identified as definite causes. Since rheumatoid arthritis is a systemic disease, its inflammation can affect organs and areas of the body other than the joints. Arthritis-related inflammation of the glands of the eyes and mouth can cause dryness of these areas and is referred to as Sjögren's syndrome. Dryness of the eyes can lead to corneal abrasion. Inflammation of the white parts of the eyes (the sclerae) is referred to as scleritis and can be very dangerous to the eye. Rheumatoid inflammation of the lung lining (pleuritis) causes chest pain with deep breathing, shortness of breath, or coughing. The lung tissue itself can also become inflamed and scarred, and sometimes nodules of inflammation (rheumatoid nodules) develop within the lungs. Inflammation of the tissue (pericardium) surrounding the heart, called pericarditis, can cause a chest pain that typically changes in intensity when lying down or leaning forward. Rheumatoid arthritis is associated with an increased risk for heart attack. Rheumatoid disease can reduce the number of red blood cells (anemia) and white blood cells. Decreased white cells can be associated with an enlarged spleen (referred to as Felty's syndrome) and can increase the risk of infections. The risk of lymph gland cancer (lymphoma) is higher in patients with rheumatoid arthritis, especially in those with sustained active joint inflammation. Firm lumps or firm bumps under the skin (subcutaneous nodules called rheumatoid nodules) can occur around the elbows and fingers where there is frequent pressure. Even though these nodules usually do not cause symptoms, occasionally they can become infected. Nerves can become pinched in the wrists to cause carpal tunnel syndrome. A rare, serious complication, usually with longstanding rheumatoid disease, is blood vessel inflammation (vasculitis). Vasculitis can impair blood supply to tissues and lead to tissue death (necrosis). This is most often initially visible as tiny black areas around the nail beds or as leg ulcers. There is no singular test for diagnosing rheumatoid arthritis. The diagnosis is based on the clinical presentation. Ultimately, rheumatoid arthritis is diagnosed based on a combination of the presentation of the joints involved, characteristic joint swelling and stiffness in the morning, the presence of blood rheumatoid factor (RF blood test or RA test) and citrulline antibody, as well as findings of rheumatoid nodules and radiographic changes (X-ray testing). It is important to understand that there are many forms of joint disease that can mimic rheumatoid arthritis. The first step in the diagnosis of rheumatoid arthritis is a meeting between the health care professional and the patient. The doctor reviews the history of symptoms, examines the joints for inflammation, tenderness, swelling, and deformity, the skin for rheumatoid nodules (firm lumps or bumps under the skin, most commonly over the elbows or fingers), and other parts of the body for inflammation. Certain blood and X-ray tests are often obtained. The diagnosis will be based on the pattern of symptoms, the distribution of the inflamed joints, and the blood and X-ray findings. Several visits may be necessary before the health care professional can be certain of the diagnosis. A doctor with special training in arthritis and related diseases is called a rheumatologist. It is the inflammation in the joint that helps to distinguish rheumatoid arthritis from common types of arthritis that are not inflammatory, such as osteoarthritis or degenerative arthritis. The distribution of joint inflammation is also important to the health care professional in making a diagnosis. In rheumatoid arthritis, the small joints of the hands and fingers, wrists, feet, and knees are typically inflamed in a symmetrical distribution (affecting both sides of the body). When only one or two joints are inflamed, the diagnosis of rheumatoid arthritis becomes more difficult. The doctor may then perform other tests to exclude arthritis due to infection or gout. The detection of rheumatoid nodules (described above), most often around the elbows and fingers, can suggest the diagnosis. Abnormal antibodies can be found in the blood of people with rheumatoid arthritis with simple blood testing. An antibody called "rheumatoid factor" (RF) can be found in 80% of patients with rheumatoid arthritis. Patients with rheumatoid arthritis and rheumatoid factor are referred to as having "seropositive rheumatoid arthritis." Patients who are felt to have rheumatoid arthritis and do not have positive rheumatoid factor testing are referred to as having "seronegative rheumatoid arthritis." Citrulline antibody (also referred to as anti-citrulline antibody, anti-cyclic citrullinated peptide antibody, and anti-CCP antibody) is present in 50%-75% people with rheumatoid arthritis. It is useful in the diagnosis of rheumatoid arthritis when evaluating cases of unexplained joint inflammation. A test for anti-citrullinated protein antibodies is especially helpful in looking for the cause of previously undiagnosed inflammatory arthritis when the traditional blood test for rheumatoid arthritis, rheumatoid factor, is not present. Citrulline antibodies have been felt to represent the earlier stages of rheumatoid arthritis in this setting. Citrulline antibodies also have been associated with more aggressive forms of rheumatoid arthritis. Another antibody called the "antinuclear antibody" (ANA) is also frequently found in people with rheumatoid arthritis. It should be noted that many forms of arthritis in childhood (juvenile inflammatory arthritis) are not associated with blood test positivity for rheumatoid factors. In this setting, juvenile rheumatoid arthritis must be distinguished from other types of joint inflammation, including plant thorn arthritis, joint injury, arthritis of inflammatory bowel disease, and rarely joint tumors. A blood test called the sedimentation rate (sed rate) is a crude measure of the inflammation of the joints. The sed rate actually measures how fast red blood cells fall to the bottom of a test tube. The sed rate is usually faster (high) during disease flares and slower (low) during remissions. Another blood test that is used to measure the degree of inflammation present in the body is the C-reactive protein. Blood testing may also reveal anemia, since anemia is common in rheumatoid arthritis, particularly because of the chronic inflammation. The rheumatoid factor, ANA, sed rate, and C-reactive protein tests can also be abnormal in other systemic autoimmune and inflammatory medical conditions. Therefore, abnormalities in these blood tests alone are not sufficient for a firm diagnosis of rheumatoid arthritis. Joint X-rays may be normal or only demonstrate swelling of soft tissues early in the disease. 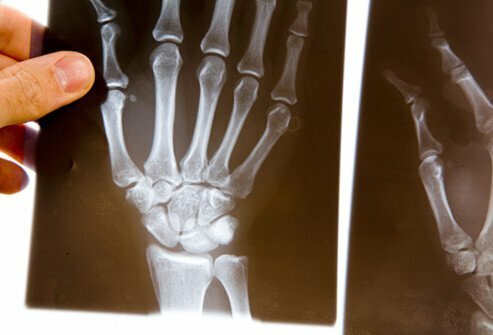 As the disease progresses, X-rays can reveal bony erosions typical of rheumatoid arthritis in the joints. Joint X-rays can also be helpful in monitoring the progression of disease and joint damage over time. Bone scanning, a procedure using a small amount of a radioactive substance, can also be used to demonstrate the inflamed joints. MRI scanning can also be used to demonstrate joint damage. The doctor may elect to perform an office procedure called arthrocentesis. In this procedure, a sterile needle and syringe are used to drain joint fluid out of the joint for study in the laboratory. Analysis of the joint fluid in the laboratory can help to exclude other causes of arthritis, such as infection and gout. Arthrocentesis can also be helpful in relieving joint swelling and pain. Occasionally, cortisone medications are injected into the joint during the arthrocentesis in order to rapidly relieve joint inflammation and further reduce symptoms. There is no known cure for rheumatoid arthritis. To date, the goal of treatment in rheumatoid arthritis is to reduce joint inflammation and pain, maximize joint function, and prevent joint destruction and deformity. Early medical intervention has been shown to be important in improving outcomes. Aggressive management can improve function, stop damage to joints as monitored on X-rays, and prevent work disability. Optimal RA treatment involves a combination of medications, rest, joint-strengthening exercises, joint protection, and patient (and family) education. Treatment is customized according to many factors such as disease activity, types of joints involved, general health, age, and patient occupation. RA treatment is most successful when there is close cooperation between the health care professional, patient, and family members. Two classes of medications are used in treating rheumatoid arthritis: fast-acting "first-line drugs" and slow-acting "second-line drugs" (also referred to as disease-modifying antirheumatic drugs or DMARDs). The first-line drugs, such as aspirin and cortisone (corticosteroids [Rayos, Celestone, Depo-Medrol, Kenalog]), are used to reduce pain and inflammation. The slow-acting second-line drugs, such as methotrexate (Rheumatrex, Trexall, Otrexup, Rasuvo) and hydroxychloroquine (Plaquenil), promote disease remission and prevent progressive joint destruction. The degree of destructiveness of rheumatoid arthritis varies among affected individuals. Those with uncommon, less destructive forms of the disease or disease that has quieted after many years of activity ("burned out" rheumatoid arthritis) can be managed with rest plus pain control and anti-inflammatory medications alone. In general, however, function is improved and disability and joint destruction are minimized when the condition is treated earlier with second-line drugs (disease-modifying antirheumatic drugs), even within months of the diagnosis. Most people require more aggressive second-line drugs, such as methotrexate, in addition to anti-inflammatory agents. Sometimes these second-line drugs are used in combination. The areas of the body other than the joints that are affected by rheumatoid inflammation are treated individually. Sjögren's syndrome can be helped by artificial tears and humidifying rooms in the home or office. Medicated eyedrops, cyclosporine ophthalmic drops (Restasis), are also available to help the dry eyes in those affected. Regular eye checkups and early antibiotic treatment for infection of the eyes are important. Inflammation of the tendons (tendinitis), bursae (bursitis), and rheumatoid nodules can be injected with cortisone. Inflammation of the lining of the heart and/or lungs may require high doses of oral cortisone. In some cases with severe joint deformity, surgery may be recommended to restore joint mobility or repair damaged joints. Doctors who specialize in joint surgery are orthopedic surgeons. The types of joint surgery range from arthroscopy to partial and complete replacement of the joint. Arthroscopy is a surgical technique whereby a doctor inserts a tube-like instrument into the joint to see and repair abnormal tissues. Total joint replacement is a surgical procedure whereby a destroyed joint is replaced with artificial materials. For example, the small joints of the hand can be replaced with plastic material. Large joints, such as the hips or knees, are replaced with metals. Acetylsalicylate (aspirin), naproxen (Naprosyn), ibuprofen (Advil, Medipren, Motrin), etodolac (Lodine), and diclofenac (Voltaren) are examples of non-steroidal anti-inflammatory drugs (NSAIDs). NSAIDs are medications that can reduce tissue inflammation, pain, and swelling. NSAIDs are not cortisone. Aspirin, in doses higher than those used in treating headaches and fever, is an effective anti-inflammatory medication for rheumatoid arthritis. Aspirin has been used for joint problems since the ancient Egyptian era. The newer NSAIDs are just as effective as aspirin in reducing inflammation and pain and require fewer dosages per day. Patients' responses to different NSAID medications vary. Therefore, it is not unusual for a medical professional to try several NSAID drugs in order to identify the most effective agent with the fewest side effects. The most common side effects of aspirin and other NSAIDs include stomach upset, abdominal pain, ulcers, and even gastrointestinal bleeding. In order to reduce gastrointestinal side effects, NSAIDs are usually taken with food. Additional medications are frequently recommended to protect the stomach from the ulcer effects of NSAIDs. These medications include antacids, sucralfate (Carafate), proton-pump inhibitors (Prevacid and others), and misoprostol (Cytotec). Newer NSAIDs include selective Cox-2 inhibitors, such as celecoxib (Celebrex), which offer anti-inflammatory effects with less risk of stomach irritation and bleeding risk. Corticosteroid medications can be given orally or injected directly into tissues and joints. They are more potent than NSAIDs in reducing inflammation and in restoring joint mobility and function. Corticosteroids are useful for short periods during severe flares of disease activity or when the disease is not responding to NSAIDs. However, corticosteroids can have serious side effects, especially when given in high doses for long periods of time. These side effects include weight gain, facial puffiness, thinning of the skin and bone, easy bruising, cataracts, risk of infection, muscle wasting, and destruction of large joints, such as the hips. Corticosteroids also carry some increased risk of contracting infections. These side effects can be partially avoided by gradually tapering the doses of corticosteroids as the individual achieves improvement in symptoms. Abruptly discontinuing corticosteroids can lead to flares of the disease or other symptoms of corticosteroid withdrawal and is discouraged. Thinning of the bones due to osteoporosis may be prevented by calcium and vitamin D supplements. While "first-line" medications (NSAIDs and corticosteroids) can relieve joint inflammation and pain, they do not necessarily prevent joint destruction or deformity. Rheumatoid arthritis requires medications other than NSAIDs and corticosteroids to stop progressive damage to cartilage, bone, and adjacent soft tissues. The RA medications needed for ideal management of the disease are also referred to as disease-modifying antirheumatic drugs or DMARDs. They come in a variety of forms and are listed below. These "second-line" or "slow-acting" medicines may take weeks to months to become effective. They are used for long periods of time, even years, at varying doses. If maximally effective, DMARDs can promote remission, thereby retarding the progression of joint destruction and deformity. Sometimes a number of DMARD second-line medications are used together as combination therapy. As with the first-line medications, the doctor may need to try different second-line medications before treatment is optimal. Research suggests that patients who respond to a DMARD with control of the rheumatoid disease may actually decrease the known risk (small but real) of lymphoma (cancer of lymph nodes) that exists from simply having rheumatoid arthritis. The various available DMARDs are reviewed next. Hydroxychloroquine (Plaquenil) is related to quinine and has also been used in the treatment of malaria. It is used over long periods for the treatment of rheumatoid arthritis. Possible side effects include upset stomach, skin rashes, muscle weakness, and vision changes. Even though vision changes are rare, people taking Plaquenil should be monitored by an eye doctor (ophthalmologist). Sulfasalazine (Azulfidine) is an oral medication traditionally used in the treatment of mild to moderately severe inflammatory bowel diseases, such as ulcerative colitis and Crohn's colitis. Azulfidine is used to treat rheumatoid arthritis in combination with anti-inflammatory medications. Azulfidine is generally well tolerated. Common side effects include rash and upset stomach. Because Azulfidine is made up of sulfa and salicylate compounds, it should be avoided by people with known sulfa allergies. Methotrexate (Rheumatrex, Trexall, Otrexup, Rasuvo) has gained popularity among health care professionals as an initial second-line drug because of both its effectiveness and relatively infrequent side effects. It also has an advantage in dose flexibility (dosages can be adjusted according to needs). Methotrexate is an immunosuppressive drug. It can affect the bone marrow and the liver, even rarely causing cirrhosis. All people taking methotrexate require regular blood tests to monitor blood counts and liver function. Taking folic acid as a supplement can reduce the risk of methotrexate side effects. Gold salts have been used to treat rheumatoid arthritis throughout most of the past century. Gold thioglucose (Solganal) and gold thiomalate (Myochrysine) are given by injection, initially on a weekly basis, for months to years. Oral gold, auranofin (Ridaura), was introduced in the 1980s. Side effects of gold (oral and injectable) include skin rash, mouth sores, kidney damage with leakage of protein in the urine, and bone marrow damage with anemia and low white cell count. Those receiving gold treatment are regularly monitored with blood and urine tests. Oral gold can cause diarrhea. These gold drugs have lost favor in the treatment of RA because of the availability of more effective treatments, particularly methotrexate. D-penicillamine (Depen, Cuprimine) can be helpful in selected cases of progressive forms of rheumatoid arthritis. Side effects are similar to those of gold. They include fever, chills, mouth sores, a metallic taste in the mouth, skin rash, kidney and bone marrow damage, stomach upset, and easy bruising. People taking this medication require routine blood and urine tests. D-penicillamine can rarely cause symptoms of other autoimmune diseases and is no longer commonly used for the treatment of rheumatoid arthritis. Immunosuppressive medications can depress bone marrow function and cause anemia, a low white cell count, and low platelet counts. A low white count can increase the risk of infections, while a low platelet count can increase the risk of bleeding. Methotrexate rarely can lead to liver cirrhosis, as described above, and allergic reactions in the lung. Cyclosporine can cause kidney damage and high blood pressure (hypertension). Because of potentially serious side effects, immunosuppressive medications are used in low doses, usually in combination with anti-inflammatory agents. Combinations of traditional DMARDs, including sulfasalazine, methotrexate, and hydroxychloroquine, have been shown by researchers to be another potent method of stopping disease progression of rheumatoid arthritis. Newer "second-line" drugs (DMARDs) for the treatment of rheumatoid arthritis include leflunomide (Arava) and the "biologic" medications etanercept (Enbrel) and biosimilar etanercept-szzs (Erelzi), infliximab (Remicade) and biosimilars infliximab-dyyb (Inflectra) and infliximab-abda (Renflexis), anakinra (Kineret), adalimumab (Humira) and biosimilar adalimumab-atto (Amjevita), rituximab (Rituxan), abatacept (Orencia), golimumab (Simponi), certolizumab pegol (Cimzia), tocilizumab (Actemra), sarilumab (Kevzara), and JAK inhibitors represented by tofacitinib (Xeljanz) and baricitinib (Olumiant). Each of these medications can increase the risk for infections, and the development of any infections should be reported to the health care professional when taking these newer second-line drugs. Leflunomide (Arava) is available to relieve the symptoms and halt the progression of the disease. It seems to work by blocking the action of an important enzyme that has a role in immune activation. Leflunomide can cause liver disease, diarrhea, hair loss, and/or rash in some people. It should not be taken just before or during pregnancy because of possible birth defects and is generally avoided in women who might become pregnant. Biologic DMARDs represent a novel approach to the treatment of rheumatoid arthritis and are products of modern biotechnology. These are referred to as the biologic medications or biological response modifiers. In comparison with traditional DMARDs, the biologic medications have a much more rapid onset of action and can have powerful effects on stopping progressive joint damage. In general, their methods of action are also more directed, defined, and targeted. Etanercept, infliximab, adalimumab, golimumab, and certolizumab pegol are biologic medications that intercept a messenger protein in the joints (tumor necrosis factor or TNF) that promotes inflammation of the joints in rheumatoid arthritis. These TNF-blockers intercept TNF before it can act on its natural receptor to "switch on" the process of inflammation. This effectively blocks the TNF inflammation messenger from recruiting the cells of inflammation. Symptoms can be significantly, and often rapidly, improved in those using these drugs. Etanercept must be injected subcutaneously once or twice a week. Infliximab is given by infusion directly into a vein (intravenously). Adalimumab is injected subcutaneously either every other week or weekly. Golimumab is injected subcutaneously on a monthly basis. Certolizumab pegol is injected subcutaneously every two to four weeks. Each of these medications is being evaluated by health care professionals in practice to determine what role they may have in treating patients in various stages of rheumatoid arthritis. Research has shown that biological response modifiers also prevent the progressive joint destruction of rheumatoid arthritis. They are currently recommended for use after other second-line medications have not been effective. The biological response modifiers (TNF-inhibitors) are expensive treatments. They are also frequently used in combination with methotrexate and other DMARDs. Furthermore, it should be noted that the TNF-blocking biologics all are more effective when combined with methotrexate. These medications should be avoided by people with significant congestive heart failure or demyelinating diseases (such as multiple sclerosis) because they can worsen these medical conditions. Biosimilar TNF-blockers include etanercept-szzs (Erelzi), adalimumab-atto (Amjevita), infliximab-dyyb (Inflectra), and infliximab-abda (Renflexis). Anakinra (Kineret) is another biologic DMARD treatment that is used to treat moderate to severe rheumatoid arthritis. Anakinra works by binding to a cell messenger protein (IL-1, a pro-inflammatory cytokine). Anakinra is injected under the skin daily. Anakinra can be used alone or with other DMARDs. The response rate of anakinra does not seem to be as high as with other biologic medications. Rituximab (Rituxan) is an antibody that was first used to treat lymphoma, a cancer of the lymph nodes. Rituximab can be effective in treating autoimmune diseases like rheumatoid arthritis because it depletes B-cells, which are important cells of inflammation and in the production of abnormal antibodies that are common in these medical conditions. Rituximab is used to treat moderate to severely active rheumatoid arthritis in patients who have failed treatment with the TNF-blocking biologics. Preliminary studies have shown that Rituximab was also found to be beneficial in treating severe rheumatoid arthritis complicated by blood vessel inflammation (vasculitis) and cryoglobulinemia. Rituximab is an intravenous infusion given in two doses, two weeks apart, approximately every six months. Biosimilar versions of rituximab are under study. Abatacept (Orencia) is a biologic medication that blocks T-cell activation. Abatacept is used to treat adult patients who have failed treatment with a traditional DMARD medication. Abatacept is an intravenous infusion given monthly or a weekly subcutaneous injection. Tocilizumab (Actemra) and sarilumab (Kevzara) are approved for the treatment of adult patients with moderately to severely active rheumatoid arthritis (RA) who have had an inadequate response to one or more disease-modifying anti-rheumatic drugs. Tocilizumab is the first approved biologic medication that blocks interleukin-6 (IL-6), which is a chemical messenger of the inflammation of rheumatoid arthritis. Tocilizumab is an intravenous infusion given monthly or a weekly subcutaneous injection. Sarilumab also blocks IL-6. Tofacitinib (Xeljanz) is the first in a new class of medications used to treat rheumatoid arthritis called JAK inhibitors. Tofacitinib and baricitinib (Olumiant) treat adults with moderately to severely active rheumatoid arthritis in which methotrexate did not work well and who have failed a TNF-blocker biologic medication. Tofacitinib can be used with or without methotrexate. This prescription medicine is taken by mouth once or twice daily. Baricitinib (Olumiant) is also an oral medication taken once daily. Tofacitinib and baricitinib are "targeted" medications that specifically block special enzymes of inflammation in joints (called Janus kinase) within cells. For this reason, medical professionals call tofacitinib and baricitinib JAK inhibitors. While biologic medications are often combined with traditional DMARDs in the treatment of rheumatoid arthritis, they are generally not used with other biologic medications because of the unacceptable risk for serious infections. Similarly, JAK inhibitor medication is not used with traditional biologic medications. There is no special RA diet or diet "cure" for rheumatoid arthritis. One hundred years ago, it was touted that "night-shade" foods, such as tomatoes, would aggravate rheumatoid arthritis. This is no longer accepted as true. There are no specific foods or food groups that should be universally avoided by individuals with rheumatoid arthritis. There is no evidence that gluten bothers rheumatoid arthritis. Nevertheless, for those who are definitely sensitive to gluten (wheat, barley, and rye), the gluten-free diet can prevent poor intestinal absorption of important nutrients because the small intestines can become inflamed in these individuals. Bowel inflammation can be detrimental for those also affected by rheumatoid arthritis if they become deficient in nutrients, such as vitamin D and folate. Nevertheless, there are some home remedies that may be helpful, although these are not considered as potent or effective as disease-modifying drugs. Fish oils, such as in salmon, and omega-3 fatty acids supplements have been shown to be beneficial in some short-term studies in rheumatoid arthritis. This suggests that there may be benefits by adding more fish to the diet, such as in the popular Mediterranean diet. The anti-inflammatory effects of curcumin in dietary turmeric, an ingredient in curry, may be beneficial in reducing symptoms of rheumatoid arthritis. Supplements such as calcium and vitamin D are used to prevent osteoporosis in patients with rheumatoid arthritis. Folic acid is used as a supplement to prevent side effects of methotrexate treatment of rheumatoid arthritis. Alcohol is minimized or avoided in rheumatoid arthritis patients taking methotrexate. The benefits of cartilage preparations such as glucosamine and chondroitin for rheumatoid arthritis remain unproven. Symptomatic pain relief can often be achieved with oral acetaminophen (Tylenol) or over-the-counter topical preparations, which are rubbed into the skin. Antibiotics, in particular the tetracycline drug minocycline (Minocin), have been tried for rheumatoid arthritis recently in clinical trials. Early results have demonstrated mild to moderate improvement in the symptoms of arthritis. Minocycline has been shown to impede important mediator enzymes of tissue destruction, called metalloproteinases, in the laboratory as well as in humans. Because impact loading the joints can aggravate inflamed, active rheumatoid arthritis and also be difficult when joints have been injured in the past by the disease, it is important to customize activities and exercise programs according to each individual's capacity. Physical therapy can be helpful. Movement exercises that are less traumatic for the joints, including yoga and tai chi, can be beneficial in maintaining flexibility and strength as well as lead to an improved general sense of well-being. Proper regular exercise is important in maintaining joint mobility and in strengthening the muscles around the joints. Swimming is particularly helpful because it allows exercise with minimal stress on the joints. Physical and occupational therapists are trained to provide specific exercise instructions and can offer splinting supports. For example, wrist and finger splints can be helpful in reducing inflammation and maintaining joint alignment. Devices such as canes, toilet seat raisers, and jar grippers can assist in the activities of daily living. Heat and cold applications are modalities that can ease symptoms before and after exercise. Medications that are commonly used to treat inflammation, such as non-steroidal anti-inflammatory drugs including ibuprofen (Motrin, Advil), naproxen (Aleve), and others, are not used during pregnancy. Drugs that are used to stop the progression of rheumatoid disease, such as methotrexate (Rheumatrex, Trexall) and cyclosporine (Neoral, Sandimmune), are not used during pregnancy and also must be discontinued well in advance of conception because of potential risks to the fetus. Biologic medications are avoided during pregnancy when possible. When rheumatoid arthritis is active during pregnancy, steroid medications such as prednisone and prednisolone are often used to quiet the joint inflammation. These medications do not adversely affect the fetus. With early, aggressive treatment, the outlook for those affected by rheumatoid arthritis can be very good. The overall attitude regarding ability to control the disease has changed tremendously since the turn of the century. Doctors now strive to eradicate any signs of active disease while preventing flare-ups. The disease can be controlled and a cooperative effort by the doctor and patient can lead to optimal health. Rheumatoid arthritis causes disability and can increase mortality and decrease life expectancy to lead to an early death. Patients have a less favorable outlook when they have deformity, disability, ongoing uncontrolled joint inflammation, and/or rheumatoid disease affecting other organs of the body. Overall, rheumatoid arthritis tends to be potentially more damaging when rheumatoid factor or citrulline antibody is demonstrated by blood testing. Life expectancy improves with earlier treatment and monitoring. Finally, minimizing emotional stress can help improve the overall health in people with rheumatoid arthritis. Support and extracurricular groups provide those with rheumatoid arthritis time to discuss their problems with others and learn more about their illness. Early and aggressive treatment tends to result in optimal outcome. Understand how your rheumatoid arthritis, as well as the effects and side effects of its treatment, will be monitored. Maintain a working relationship with your treating physician. Consider consulting with a rheumatologist. Have a game plan for addressing flare-ups of the rheumatoid inflammation. Preplan your treatment options for travel with your physician. Review with your physician any concerns about your rheumatoid arthritis, its influence on your lifestyle activities, your avocations, and your long-term life goals. The primary specialist for diagnosing, managing, and monitoring rheumatoid arthritis is a rheumatologist. The rheumatologist works together with the primary doctor and other specialists to maximize health outcomes and minimize comorbid health conditions. Other specialists that can be involved in the care of patients with rheumatoid arthritis include physiatrists, dermatologists, pulmonologists, cardiologists, nephrologists, radiologists, neurologists, endocrinologists, orthopedists, and general surgeons. Ancillary health care providers who can be involved in the care of patients with rheumatoid arthritis include physical therapists, occupational therapists, and massage therapists. No, rheumatoid arthritis is not a curable disease at this time. As the science of genetics and disease as well as autoimmunity evolve, it is very likely that cures for rheumatoid arthritis will become available. Currently, there is no specific prevention of rheumatoid arthritis. Because cigarette smoking, exposure to silica mineral, and chronic periodontal disease all increase the risk for rheumatoid arthritis, these conditions should be avoided. There are support groups for rheumatoid arthritis in all major cities in the United States. Many are affiliated with local hospitals and/or local chapters of the Arthritis Foundation. There are many new biologic treatments for rheumatoid arthritis on the near horizon. Many of these are being studied with and without simultaneous methotrexate. Some block chemical messengers and some block specific cell types of inflammation. The significant benefit of treating lipid/cholesterol profiles in patients with rheumatoid arthritis to improve long-term risks of stroke and heart attack was emphasized. Diets that were higher in fish, grains, and vegetables were shown to decrease the risk of developing rheumatoid arthritis, while the Western diet, defined as including more processed meats increased the risk. It is not certain whether this is because of a direct anti-inflammatory effect of the fish, grains, and vegetables or because of changes in the natural bacteria in the gut. Scientists throughout the world are studying many promising areas of new treatment approaches for rheumatoid arthritis. Indeed, treatment guidelines are evolving with the availability of newer treatments. These areas include treatments that block the action of the special inflammation factors, such as tumor necrosis factor (TNF alpha), B-cell and T-cell function, as well as interleukin-1 (IL-1), as described above. Many other drugs are being developed that act against certain critical white blood cells and chemical messengers involved in rheumatoid inflammation. Also, new NSAIDs with mechanisms of action that are different from current drugs are on the horizon. Further biosimilar versions of the biologic medications, including rituximab, are under study. Better methods of more accurately defining which patients are more likely to develop more aggressive disease are becoming available. Recent antibody research has found that the presence of citrulline antibodies in the blood (see above, in diagnosis) has been associated with a greater tendency toward more destructive forms of rheumatoid arthritis. Studies involving various types of the connective tissue collagen are in progress and show encouraging signs of reducing rheumatoid disease activity. Finally, genetic research and engineering are likely to bring forth many new avenues for earlier diagnosis and accurate treatment in the near future. Gene profiling, also known as gene array analysis, is being identified as a helpful method of defining which people will respond to which medications. Studies are under way that are using gene array analysis to determine which patients will be at more risk for more aggressive disease. This is all occurring because of improvements in technology. We are at the threshold of tremendous improvements in the management of rheumatoid arthritis. Costenbader, Karen H., and Elizabeth W. Karlson. "Epstein-Barr Virus and Rheumatoid Arthritis: Is There a Link?" Arthritis Res Ther 8.1 (2006): 204. Crane, M.M., et al. "Epidemiology and Treatment of New-Onset and Established Rheumatoid Arthritis in an Insured US Population." Arthritis Care Res (Hoboken) 67.12 Dec. 2015: 1646-1655. Doran, M.F., C.S. Crowson, G.R. Pond, W.M. O'Fallon, and S.E. Gabriel. "Predictors of Infection in Rheumatoid Arthritis." Arthritis Rheum 46.9 Sept. 2002: 2294-2300. Firestein, G.S., et al. Kelley's Textbook of Rheumatology, 9th Ed. Philadelphia, Pa: Saunders Elsevier, 2012. Fugger, Lars, and Arne Svejgaard. "Association of MHC and rheumatoid arthritis: HLA-DR4 and rheumatoid arthritis - studies in mice and men." Arthritis Res 2.3 (2000): 208-211. Garfin, Steven R. "Rheumatoid Arthritis of the Cervical Spine Overview of Rheumatoid Spondylitis." Medscape.com. Dec. 6, 2015. <https://emedicine.medscape.com/article/1266195-overview>. Hedstrom, A.K., L. Klareskog, and L. Alfredsson. "Exposure to passive smoking and rheumatoid arthritis risk: results from the Swedish EIRA study." Ann Rheum Dis May 3, 2018. Helmick, C.G., et al. "Estimates of the prevalence of arthritis and other rheumatic conditions in the United States. Part I." Arthritis Rheum 58.1 January 2008: 15-25. Koopman, William, et al., eds. Clinical Primer of Rheumatology. Philadelphia, Pa: Lippincott Williams & Wilkins, 2003. McInnes, Iain B., and Georg Schett. N Engl J Med 365 (2011): 2205-2219. McInnes, I.B., and J.R. O'Dell. "State-of-the-art: Rheumatoid Arthritis." Ann Rheum Dis 70.2 Feb. 2011: 399. Miese, Falk R., et al. "Metacarpophalangeal Joints in Rheumatoid Arthritis: Delayed Gadolinium-enhanced MR Imaging of Cartilage-A Feasibility Study." Radiology 257.2 Nov. 1, 2010. <https://pubs.rsna.org/doi/full/10.1148/radiol.10100459>. Raaschou, P., et al. "Rheumatoid arthritis, anti-tumour necrosis factor therapy, and risk of malignant melanoma: nationwide population based prospective cohort study from Sweden." BMJ Apr. 8, 2013: 346. Seo, Philip, et al. Oxford American Handbook of Rheumatology. United States: Oxford University Press, 2009. Singh, J.A., et al. "2015 American College of Rheumatology Guideline for the Treatment of Rheumatoid Arthritis." Arthritis Rheumatol 68.1 Jan. 2016: 1-26. Weisman, Michael H., et al. Practical Rheumatology, 3rd Ed. Philadelphia, Pa: Mosby, 2004. Arthritis and injuries can leave your joints swollen, tender, and damaged. Discover treatments for morning stiffness, sore joints, hip pain, and other conditions. Learn when it’s time to call a health care professional, as well as joint-friendly exercises that can bring pain relief and ease of movement for arthritis sufferers and others. Early RA symptoms and signs vary differently from person to person. The most common body parts that are initially affected by RA include the small joints of the hands, wrists, and feet, and the knees and hip joints. Joint inflammation causes stiffness. Warmth, redness, and pain may vary in degree. Learn more about the famous faces of rheumatoid arthritis such as Lucille Ball, Glenn Frey, and more. Steroids decrease inflammation and may be used to treat many inflammatory conditions and diseases, such as systemic vasculitis, rheumatoid arthritis, lupus, and Sjögren's syndrome. Steroids are injected, rather than administered orally, to deliver a high dose of medication to a specific area. Side effects of steroid injections include infection, tendon rupture, skin discoloration, allergic reaction, and weakening of bone, ligaments, and tendons.